A History of the Church of Saints Coan and Brógan Clonea Power was launched recently by Julian Walton historian and broadcaster. 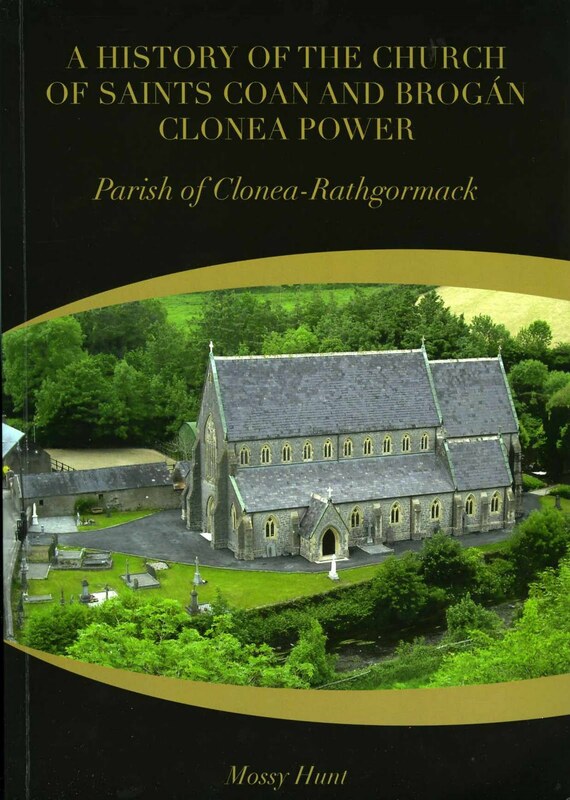 This lavishly produced book was written by Mossy Hunt local historian and was launched in conjunction with the re-dedication of the church on July 10th the feast day of the Saints. The church was designed by J. J. McCarthy in 1860 and completed in 1863. The Gothic style church was built of limestone with Bath stone windows and door surrounds. An attractive feature of the church is the stained glass windows. These are by Joshua and Harry Clarke Studios and Watsons of Youghal. Many pictures in the book are dedicated to these windows. The Harry Clarke windows stand out because of their vibrant colour and sophisticated design. The book divided into 12 chapters covers many items of interest regarding the church and its parish. The cross of Mothel which was made in the 15th century is one item, as is the life of Fr. Dowley one of the founders of the church. A family tree for the priest is in included as are some pages from his parish ledger. A list of some of those buried in the graveyard is given at the back of the book, which may be helpful for anyone wishing to trace their family roots. Overall this is a very colourful and well produced publication with many interesting features on the church. It is available to buy at €20 here in the museum, from the Author Mossy Hunt at 051-646187 and Marie Cox at 051-396626.